Long-standing members of Great Bentley Running Club will remember Geoff Day and his achievements and more recent members may well have seen his name at the top of all but one of the Great Bentley Running Club men’s “Top Ten” times. He was a lovely person and a gifted runner, coming first or second in many races. Sadly, his life was prematurely cut short. His Father, Alan Day, has provided us with a brief history of Geoff’s life, along with newspaper extracts from Geoff”s scrapbook, which shows a couple of his road racing exploits. 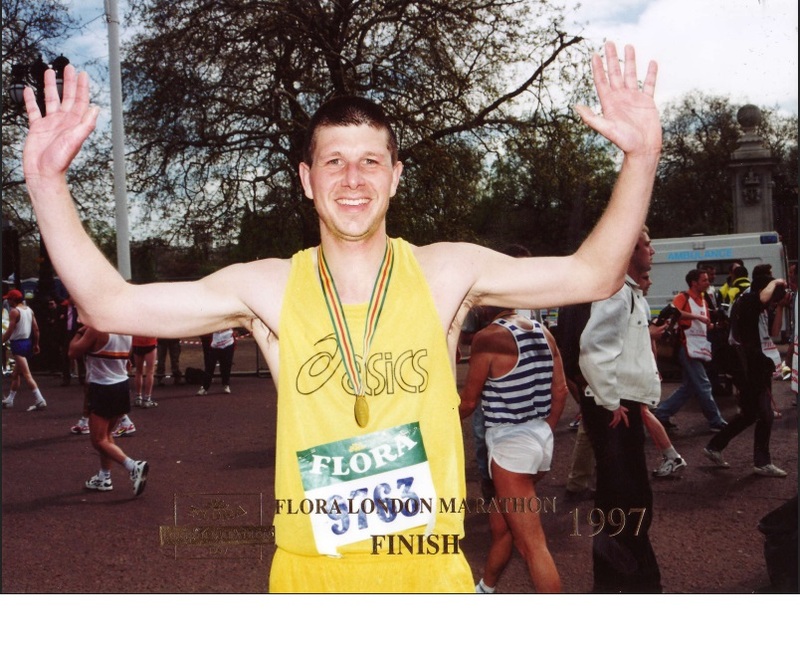 The following is a picture and newspaper cutting from his London Marathon of 1999. Finally, here is a list of some of his races, showing race times and positions. Alan has donated a super trophy in his memory. It will be awarded to the fastest Great Bentley runner in a special Geoff Day Memorial 5k to be held every year. It would be great if as many GBRC members past and present could run and/or attend.